Has Layton inherited the federal mantle of Quebec separatism? I knew we would find a good reason to miss former Bloc leader Gilles Duceppe, I just never imagined it would happen this quickly. 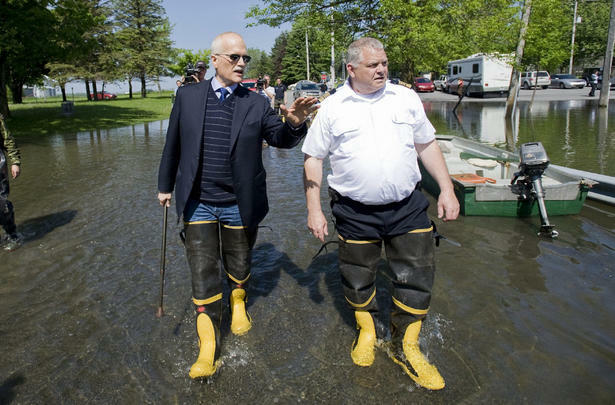 Images of Jack Layton in the CBC and elsewhere have surfaced recently, featuring Layton, cane in hand and in hip-waders, galumphing through knee-high water in flood-devastated regions of Quebec. In looking at these images, I noticed how comfortable Jack looked in his new role as leader of the Opposition. But on closer inspection, I realized how surprised I was to see that is was Jack, and not Gilles, in hip-waders. Because when a leader is needed on the scene in Quebec to represent their interests, the man they are going to call will not be Duceppe, and it wont be the Prime Minister. Jack Layton, MP from Toronto and leader of the Official Opposition, has inherited the Bloc’s cause in Ottawa through the sheer volume of seats won. Whether this is a mantle he wants or not, it is almost pointless to ask: he has it, so what is he prepared to do with it? Opinions are mixed on the issue. Without even diving into the 2005 Sherbrooke Declaration on the NDP’s Quebec sovereignty policy, the issue is cloudy. And even I run back and forth between the National Post’s ‘Layton-is-now-a-socialist-AND-a-separatist’ take on the matter (except I don’t see Layton’s ‘socialism’ as a dirty word), and the Globe and Mail’s coverage that seeks to answer whether Layton and the NDP are now trying to out-Bloc the Bloc. Unfortunately today, Jack Layton’s romancing of the Quebec sovereignist vote appears to have resulted in the NDP leader taking on the role of indulgent federal landlord of the Quebec separatist agenda. That Mr. Layton, as a Toronto member of parliament and the leader of Her Majesty’s official opposition would allow himself to be so swayed (intimidated?) so quickly by his Quebec caucus to publicly endorse the Parti Quebecois position that 50%+1 wins the day in the next sovereignty referendum is of concern. The New Democrats…risk becoming known as a Quebec party with dubious ties. “My goal,” Mr. Layton says, “is to work on concrete solutions now, so we wouldn’t have to face a referendum question. Wouldn’t that be the ideal scenario?” That sounds reasonable enough. Mr. Layton can hardly be expected not to agitate on Quebec’s behalf. But therein lies the problem. The unsettling noises were okay coming from the Bloc. From a federalist party, they threaten the long-running détente. At its core, Mr. Layton is simply supporting those who gave his party their largest showing in Canadian parliamentary history. While Layton has no direct Quebec constituents, he would be right in feeling that every voter in Quebec is a member of Toronto-Danforth, for all that they gave him and his party. Above and beyond the flooding occurring in the Richelieu Valley being terrible and worthy of federal government support, Layton is making sure that he dances with the one that brought him. While I doubt he was intimidated, as Green suggests, by his Quebec caucus, they will be a hard faction of his party to ignore or temper, given their sheer size and power within the NDP. And in this, I do believe there is justifiable concern: we have not been talking about Quebec sovereignty and the Clarity Act with any seriousness in this country in quite some time, and that these discussions have returned, let alone gained prominence, is troubling. An official opposition that supports 50% + 1 for Quebec sovereignty? And they have national representation? This should concern everyone but those in Quebec who wish to separate. I do not believe that if push came to shove that Jack would support the sovereignty of Quebec. Yet with his thoughts on the matter being of public record, and with his being in support of a 50% + 1 mandate, he would lose all credibility if he backtracked on such an issue of national importance. See? I told you we would miss Gilles Duceppe.